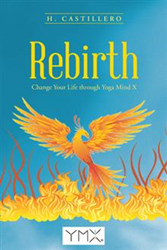 Using a “rebirth process” to regain his life and overcome the tragedy of his divorce, yoga teacher H. Castillero shares the principles he used to help others overcome their own tragedies in “Rebirth: Change Your Life through Yoga Mind X” (published by Balboa Press). The book presents a process that helps others find new purpose and direction in the midst of tragedy. Based on universal principles and truths that contain wisdom and practical solutions, Castillero’s rebirth method has the potential to transform lives. “Yoga Mind X will transform your world within your mind and your environment,” he says. “Through meditation and breathing techniques, yoga postures, and energy healing, you can embark in your own rebirth journey.” “Rebirth” is a self-improvement guide that can renew one’s mind, body and soul through a path of self-realization and higher consciousness. H. Castillero is a registered yoga teacher with Yoga Alliance. His practice includes Hatha, Kundalini and Ashtanga styles, as well as holistic medicine such as Ayurveda and Reiki. Through a mind, body and soul connection, Castillero overcame the tragedy of his divorce, finding self-realization and a calling to help others. He lives with his two daughters in Florida. This is his first book. More information can be found at: rebirthyogamindx.com.